Papillion, Neb. 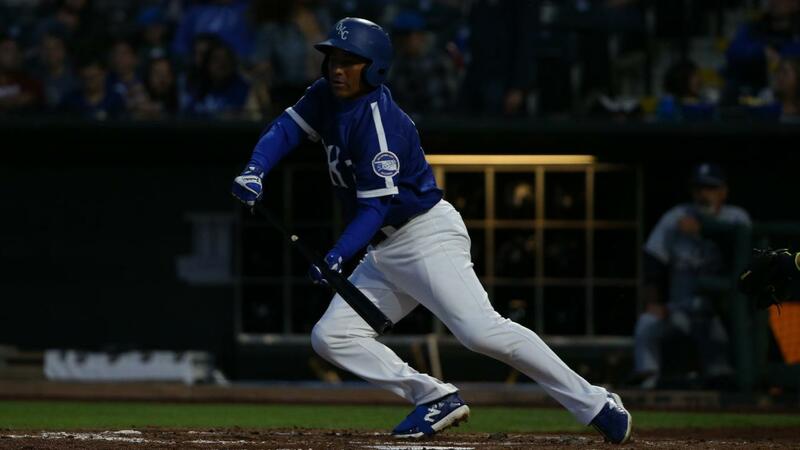 - The Oklahoma City Dodgers emerged from an offensive rut with a six-run second inning to take an early advantage as the team set new season highs in several offensive categories during a 7-5 win over the Omaha Storm Chasers Wednesday night at Werner Park. The game was played in chilly and blustery conditions, with temperatures in the low 40s and an unrelenting wind blowing in from right-center field at 20-25 miles per hour, placing wind chills in the mid-30s. The game was called in the top of the eighth inning due lightning and rain. Despite the unfavorable environment, the Dodgers (3-4) set new season highs with seven runs, 13 hits and five extra-base hits. Through the first six games, the team was last in the Pacific Coast League with 17 runs scored and second-to-last in hits. Five players finished with multi-hit games, after the Dodgers had collectively tallied just four multi-hit performances in the team's first six games. Daniel Castro also became the first Dodger with three hits in one game while notching his team-leading third multi-hit game. The Dodgers empathically broke out their recent slump in the second inning, piling up six runs on six hits. The rally started when Omaha shortstop Nicky Lopez committed a two-base throwing error on a grounder hit by Kyle Garlick leading off the inning. Jake Peter followed and ripped a RBI single to give the Dodgers the lead and mark the first time in seven games this season they had scored first. With runners at second and third base and one out, Ezequiel Carrera singled up the middle to drive in both runners. Following a base hit by Daniel Castro, each of the next three plate appearances resulted in a run: a RBI double by Matt Beaty, a sac fly by Will Smith and a RBI double by Edwin Ríos. The six runs in the second inning matched what the Dodgers had scored in their past 28 innings combined and was also the first time this season the Dodgers scored at all in the either the first or second inning. Omaha (4-3) took advantage of a series of OKC miscues in the third inning to score twice, following a leadoff walk and a missed catch in right field by Garlick. The Storm Chasers further narrowed the gap in the fourth inning. Each of the first four batters walked, leading to a run. After a force out at home and strikeout for the first two outs, Cheslor Cuthbert poked a two-run single down the first base line to cut the Dodgers' lead to 6-5. It remained a one-run contest until Cameron Perkins picked up a RBI single in the seventh inning to give the Dodgers some more breathing room. With the Dodgers batting in the top of the eighth, the game entered a weather delay, which lasted 35 minutes before the game was officially called. OKC reliever Kevin Quackenbush retired six of seven batters faced between the fourth and fifth innings to claim the win. Quackenbush (1-0) allowed one hit and notched four strikeouts. Zach McAllister followed Quackenbush with two scoreless frames and two strikeouts and was credited with his first save of the season. Arnaldo Hernandez took the loss after allowing six runs (three earned) and eight hits over four innings. He walked one and struck out four. Last season, Hernandez (0-1) allowed just two runs and eight hits over 15 innings in two outings against the Dodgers. The Dodgers finish their three-game set in Omaha at 6:35 p.m. Thursday at Werner Park, looking to win the rubber match. Live radio coverage of each game begins 15 minutes before first pitch on AM 1340 "The Game," 1340thegame.com and through the free iHeartRadio or MiLB First Pitch apps.